The thoughts and ideas of U.K author and philosopher Richard Gordon. The Universal Energy symbol / Sigil and Talisman are all copyright © all rights reserved, Richard Gordon 2013. Please note that this is a free to use symbol on a personal basis, and that any commercial reproduction is strictly forbidden, the copyright is in place so to record its point of origin thus preventing the corruption of its original meaning, also being hijacked by multinational companies. The universal energy symbol and related article has now featured in has now featured in many international magazines and websites including "The Enlightening Times", "Disinformation" and has even been featured by "Truth watch" , it also now has it's own Facebook page! Since before the dawn of recorded history mankind has sought to define, connect, even harness the powers of the universe via the use of symbols or talismans. Many of these symbols have been used as a method of protection whilst others, such as the cross have been seen to be a direct link between themselves and their chosen god. During the 1990’s I spent an extended period of time doing in depth study in regards to symbols and their meanings or origin. I remember thinking at the time that it was strange that there appeared to be very little out there that could be employed in the representation of the universal whole. Some 18 year or so later I returned to my original research and was surprised to find that there was still was no convincing universal symbol that had come into common use. After a lengthy discussion with several respected occultists on the subject of whether or not Humanity actually needed something that would represent the universe, it appeared that they were mostly in agreement towards the idea of there being one, and so I decided to take up the challenge of perhaps creating such a symbol. Several days later I realized that it wasn’t going to be anywhere as near straight forward as I had imagined it to be. If the symbol were ever to have the chance of being universally accepted two major stumbling blocks would need to be addressed. Firstly it could not be seen to represent or favor any single belief system over another; it would have to be devoid of having any reference or resemblance to traditional religious symbolism such as icons or mandalas. Secondly it would also have to avoid the pitfalls of appearing to be based on any of the myriad of traditional esoteric seals or symbols. This being the case I decided to do a little research into some of the symbols that other people have proposed to fill the space over the last few years. What struck me immediately about many of the ones I came across was that they mainly appeared to be either based on traditional symbols such as the infinity figure (like the number 8), or tended to be very over complex designs incorporating well known structures such as the flower of life or in some cases even including the all seeing eye. After some deliberation I made a start on the work, I decided that whatever I was to come up with would also need to portray a deeper meaning, as matter is said to be a physical manifestation of energy, I concluded that my design should not only represent the universal whole but also in some way imply the energetic nature of the reality that manifests within it. 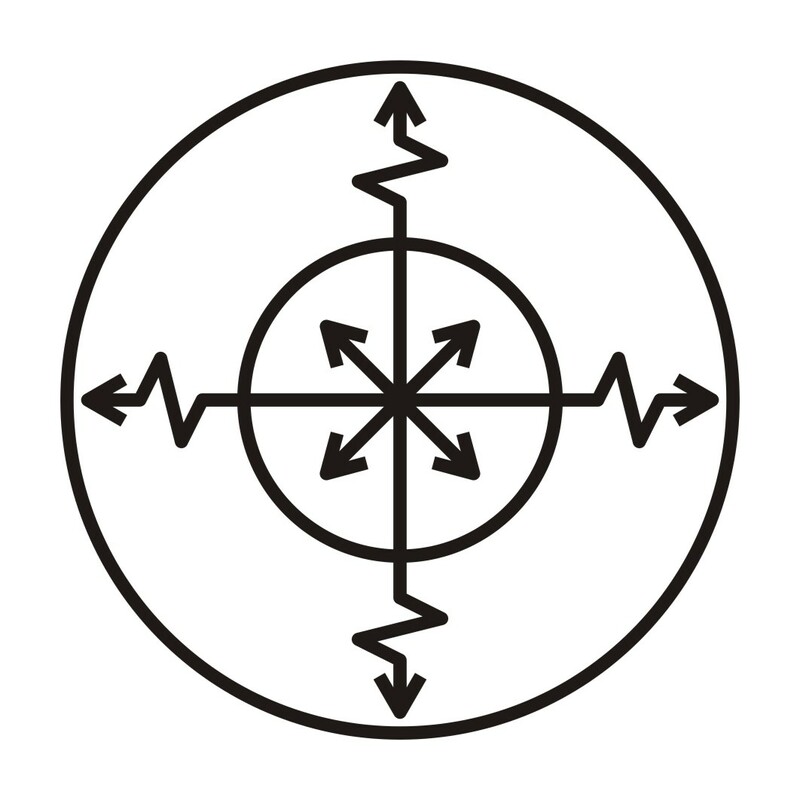 Further to it being a complete symbol of the universe I thought that my proposed design should also lend itself to becoming a master sigil or talisman of universal energy or even be utilized as a healing energy sign. For the benefit of those of us that haven’t heard of sigils, the term sigil is derived from the Latin sigillum, meaning seal, these are often used in magik to represent and call spirits or demons but can alternatively be a stylized magikal symbol that is created as a means of bypassing the minds filters and delivering the information directly into the subconscious where it may help manifest a desired result. The presented image is my design of “The Universal Energy Symbol” it conveys how that which we often perceive as being the universal whole, is then again contained within a greater whole, and that the living essence/energy that runs throughout its entirety may take many varied and dynamic paths before it condenses into what we refer to as reality. Energy is seen to move outwards in all direction whilst being rooted to an inverted circle of arrows at its core indicating that, as in mystical tradition, the center of the universe simultaneously co-exists within all points within the universe and that any sense of separation is no more than an elaborate illusion. The Universal Energy Symbol will hopefully become a positive symbol of Hope and peace for Humanity! People often seem to be interested in my life, or more accurately, in how I came to be me. Most of what you may hear or read about me is more than likely true, but just to put the record straight, here's a very brief summary of my life to date. I was born dead with umbilical strangulation, but they brought me back, this is why I feel that I've always had a foot rooted in both worlds. As to my family, I was born the son of a humble carpenter in the little market town of Beverley, (bet that sounds familiar lol, but actually it’s true), my mother worked as a stenographer but gave up her job to set up a selling service. Nothing much of a worthy mention happened until I was around six years old, unless you count the fact that I have a brother who is two years younger and that my parents moved into a house that backed onto an abandoned farm. By the age of six I had started to take an interest in anything that had a freakish nature, I felt different to other children my age in many ways. Whilst they played with dolls I collected fossils and no end of curios that I was given by my parents who had started a house clearance business. If any jobs came in on the weekend I would go along and help sort through the junk and treasures and then hopefully pick out a few choice items for what I referred to as "My private museum". It was around this age (6-7 years old) when, in one of the house clearances, I found a small library of old esoteric books that included works by Crowley and Eliphas Levi. I kept some of the more interesting ones including an early edition of "The sacred magic of Abramelin” Above all I found this book to be intriguing, mainly due to the lettered and numbered magikal squares that it contained. As time moved on I became ever more interested in our human potential, psychic powers and anything of an occult or psychic nature. Above all I became more interested in the idea that the power of magik was real, even if I was informed by my peers that it most certainly wasn't. So I picked up several other esoteric books and also studied folklore and many other beliefs via a magazine that was entitled "Man myth and magic". At the age of thirteen, I started a new school and met a friend called Mark who also had a great interest in magi. The school allowed the pupils to set up their own lunch time clubs, so we, along with a couple of others, started a magikal practice and study club. It was going great until the highly religious school headmaster got wind of what was going on. On arriving at school the next morning we were ordered to give up our group, and were then dragged up before the heads of year and told ask the lord god for forgiveness. I, of course, refused to do this and so was removed to another class where Mark and I wouldn't come into contact with each other. I am dyslexic and they simply didn't pick up on it at school, so rather than receiving personal help and encouragement, I was overlooked in favour of other allegedly brighter pupils. I have of course discovered since then, that dyslexics, if anything, tend to be on the intelligent side, it's down to the way that our brains process information, one of the most famous being none other than Albert Einstein. At the age of 17, I abandoned Art College in favour of finding a job to finance my ever growing interest in night club culture and the bizarre creatures that attended them. I became totally absorbed in the scene and dressed to excess, these were crazy days that I totally loved. Every few weeks I would change my image: sometimes my hair would be spiked a foot high, only to be followed by cut short with a quiff. I tried endless looks (not all of them worked! lol) and people would often use pictures of me on posters to promote their clubs nights. I was totally outrageous and most certainly out of control, but these days were good and the chaotic feeling of the time just added to the fact that anything could happen at any moment. By the way, I should have mentioned that I was in a relationship that was to last some 28 years, but I'll come to that shortly. By the mid to late 1980's the original scene had just about died a death so I latched onto the emerging rave scene, the atmosphere at these events was great, there was something almost primordial about the energy that was raised by the raging dancers, and it started to remind me of my neglected magikal studies. I had continued with the interest but hadn't practiced much for quite some time. Then a strange idea came to me; basically I decided to wear my cloak to these events and see them as a ritual, after all there were endless amounts of energy being released so it seemed like a great opportunity to make use of it. It was at this point that I had the opportunity to do a little study with a South American and then a Siberian Shaman. I'd read about the practice in an obscure journal and felt it matched very well with my own studies. After absorbing the basics, such as entering trance states via drumming and the healing harmonics that are contained in vocal tones, I added the principles to my own eclectic system. I then decided it was due time to put theory into practice. There was a lengthy ritual described in the book of Abramelin that was intended to deliver knowledge of and conversation with your Holy guardian angel. The ritual would take around 18 months and would involve me practically becoming a puritan. To cut a long story short, I decided to opt out of society, leave my job, and concentrate my efforts into the great work, my magikal path. The first attempt at the ritual only lasted a few weeks, I loved drinking on my nights out and so progress felt to be nothing more than boring, the second attempt lasted a little longer but yet again I decided that it was beyond me to even think of completing. I then decided to give it one last go, this time I was determined, and although the days were slow to pass, they did pass and before I knew it the ritual was nearly over. I completed the ritual high up in the snow-capped Scottish mountains and yes indeed the "Angel" did speak to me. As this time approached I had started to alter internally, not just mentally but physically, certain foods appeared to be intolerable to me, a few days after the ritual all hell broke loose and I entered the fabled shamanic death and rebirth, my body, sight and soul had been totally shattered, I had medical tests but they found no physical or mental problems that could explain what I was experiencing. I lived out the next five years in a body that felt foreign to me, a shell that I seemed to have little contact or interaction with. My sight was reduced to two dimensions, it was as if I had somehow sidestepped away from myself within the structure of reality. But, given time, I slowly became myself again. Not the old me, a complete new version of myself that could see the world through new eyes. The new world appeared to be flowing with energy, and my mind seemed to be somehow different, better, more fluid, as if I'd created a second ego in my subconscious mind that was capable of passing on unfiltered information directly to me, hard to describe but akin to having an overtone of information that downloads directly into the conscious mind. Although doing anything constructive during this period wasn't easy I had managed to set up a business selling antiques, it turned over a reasonable income, whilst giving me plenty of time to peruse my studies. I spent hours and sometimes days in meditation either at home or in remote places such as the North Yorkshire moors. I will confirm that I also wrote articles and poetry using several pseudonyms during this period for many underground style magazines, but would rather leave that work behind as my theories have evolved somewhat since those days. By the mid 1990's things stagnated a little, I became ever more bored with life in general. Life had felt promising but I now seemed to somehow be in the wrong life. Don't get me wrong, I got married and continued to live a party fuelled life, but something was missing. I had a few good friends but the rest of my life felt to be devoid of magik. I spent most of the time on short holidays, there were some great times, especially those I spent on the east coast in places like Whitby, long summer days sat in bars by the sea, and the winter’s evenings were even more spectacular. I had put much of my concentration into collecting the bizarre and obscure, I'd also decided to return to writing, but not in publications, I mainly decided to work within esoteric chat rooms, here I could be incognito and wait to see the responses to my thinking. This period was very enjoyable, but still things didn't feel right, and my drive towards correcting things eventually forced me to take drastic action. I decided to go up onto the North Yorkshire moors and do a complex ritual that was designed to realign my life path. So we headed up there and combined a weekend away with the ritual work. The ritual itself was rather short, an hour or so, but deep down I knew it had worked and that it would be the end of the safe life I had always known. When the change came, it came fast: in fact it started a roller-coaster period of change within the structure of my life that I wasn't prepared for. Within a matter months my relationship of 28 years was over, and that was only the start of things to come. It was at this point I decided to appear on the internet under my own name, within the next year I found myself co-running an esoteric website that was based in America with friend and fellow thinker Jordan Mikena, the S.A.K.R.E.D site gave us the opportunity to build on ideas and projects and also open up different conversations with like-minded people, and we spent many hours in very deep conversation (as we often still do). Around the same time I entered a new relationship, but it wasn't what I was expecting. Without going into it I'll just say that some experiences only serve to make us stronger and shouldn't be dwelled upon! I seemed to be creating more than a little interest in my life and ideas, and after an argument that appeared in the press over the ownership of a genuine shrunken head I'd purchased from an auction I agreed to do an unprecedented appearance and short interview for the world renowned Bizarre magazine. I was infamously pictured in the ritual cloak whilst holding a statue of Baphomet alongside a photo of some of my collection that includes, ancient human elongated skulls, head-hunter skull, shrunken heads, and mummified hands and feet. The interview itself was badly cut and made me sound quite mad, but then I knew it would. Over a several year period I had also been working with several other occultists and artists, I had the idea of producing works of art such as posters featuring characters such as Crowley and Baphomet, I actually redesigned Baphomet with well-known artist and witch Rowan Wulfe so that he has bats wings, it seemed more fitting!, we've since started work on several projects including illustrated books that will come to fruition in the near future. In time I made alliances with several other very well-known occultists, and after lengthy discussions with the late, well respected friend and internet mage Ronniucci Gasparri (Ron), we made plans for the Universal Order of Telos to be created, of which I'm now the head. We came up with several names at the time, but this summed up our beliefs more than most and as group we aim to go mainstream with public membership in the near future. The intention of the order will be to send out regular messages of hope and wisdom to humanity. I'm also working on a book to accompany the order, ‘The Lakharne’. It will put forward an alternative theory of how the universe and humanity came to be that poetically unites evolution with creationism in several short chapters followed by a second section that will be a book of magik. People appear to see me in many ways ranging from fantastically outrageous, to being painfully shy, a madman to great thinker and holy man, I guess the truth of the matter is that they instinctively know that I'm the real deal, I don't pretend to be sat meditating in a temple 24 hours a day, I have a real life, I dance, I drink, I practice magik. In the last few years I've started to write and publish regular articles in well-known Pagan journals both here and abroad such as Greenmantle and the enlightening times. These outline many of my beliefs and ideas and appear to be very well received, I think the world needs to open up to the true nature of reality and see what we can actually achieve. As time has moved on I've entered a relationship with my artist friend Rowan Wulfe, we both had a great interest in everything esoteric, and also dressing up for events such as Whitby Gothic festival, our meeting appeared to be destined from the moment I did that life changing ritual, perhaps it was always meant to be, but it was much more complex than that, a great chain of events had to take place before we eventually got together, but that's another story. As to the future, I will simply say, watch this space, it's going to be magikal! The universe as we know it is no more than an elaborate illusion, and the greatest illusion of all is that of separation, everything we behold within our personal experience is connected via the living energy that lies at its core. The power of magik is our birthright, with a little understanding we can choose to direct or own destinies against the universal flow of creation. Science originally set out to disprove the validity of esoteric belief systems, but in its great wisdom and teachings it has only managed to reinforce the validity of the fact that the living energy matrix is that which that great Mages, Mystics, shaman and spiritual beings have always claimed it to be, only by acting akin to a virus within its mainframe can we gain freedom and guide our own realities in a willed direction. I will be regularly sharing some of my insights and published work as well as links to journals and magazines and other publications that I appear in, as well as examples of my photography and artwork. In time I hope try and answer or at least shine a little light upon the great questions that have evaded humanity since before the dawn of history. I'm a philosopher, published writer and occult practitioner,as well has being a sometime artist, photographer. I have a somewhat gothic persona, I think I'd best describe myself as a mystical occultist, as a writer you will often find my work amongst the pages of well known esoteric and pagan journals such as "Greenmantle" , disinformation and the "Enlightening times".